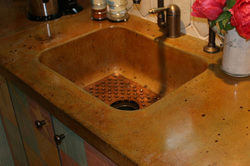 Integral concrete sinks have a clean look that is free of seams or overhangs. They have the beauty of being built into the countertop. These sinks are common in vanities but are at home in the kitchen as well. Custom bowls can be combined with other countertop elements for stunning effect. A built in drain board or drain flutes add to the harmony of this combination. Small spaces may have a large sink basin and minor countertop area. Wings of concrete can extend the top just the right amount for decorative inlays or just a bar of soap.